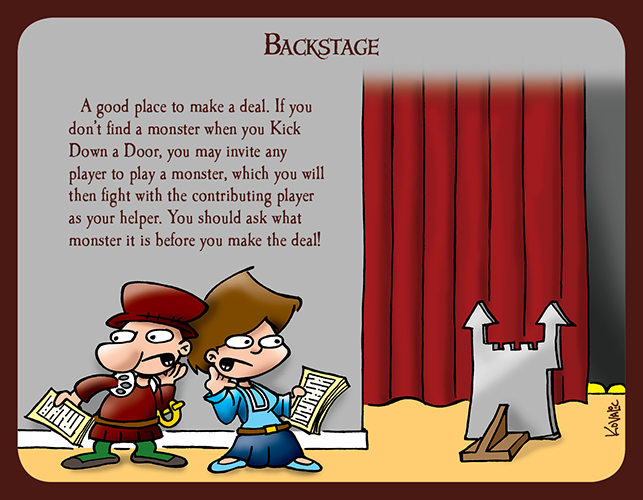 Seeing how a stage is so important, we've decided to integrate that into Munchkin Shakespeare through Dungeon cards. Dungeons are oversized cards (like in Munchkin 6: Demented Dungeons and Munchkin 6.5: Terrible Tombs) used to represent a room, or a location, or (in this case) a stage! These Dungeons come with the Kickstarter-exclusive expansion, Munchkin Shakespeare: Limited Engagement. And we've got a preview for you! Of course, this is not final artwork, but it gives you an idea of what these cards look like and what they can do: When you're Backstage, you don't have to worry about finding monsters; you can always make a deal with your fellow thespians! Just make sure to ask what the monster is, or you may be in over your head. If you get Munchkin Shakespeare: Limited Engagement during the campaign, you'll get at least 20 Dungeons! Plus, we're including a few blank Dungeons, a card we haven't made before, for you to create your own stages. You can get more blank Dungeon cards with the Munchkin Blank Card Pack add-on as well, if you're feeling extra creative. There's not much time left in the Munchkin Shakespeare Kickstarter campaign, so back today to make sure you get the exclusive Munchkin Shakespeare: Limited Engagement, and these sweet Dungeon cards! We'll see you on stage!